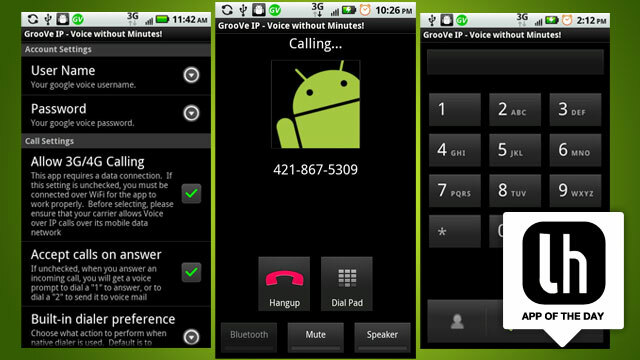 GrooVe IP allows you to make phone calls without consuming your rate calls with Google Voice . Its operation is based on VoIP (Voice over IP) and use the internet, specifically through Wi-Fi to make free unlimited calls to another phone . I will say up front that I tried the lite version (free) of this application, in part because it is the one you will use most of those who read this article, and partly because the paid version (3.99 €) provides no notable extra features - the removal of ads, call capacity in mobile networks and Wi-Fi not only the proximity sensor alerts, integration with the native dialer and the ability to change the state - and you might say, well, that allows the call over 3G is fine, and yes, it's true, all right, but with the limitations of the data rates that we have in the country-we-because we are almost not worth it. That said, the free version is pretty good . I decided to test the application on a device that normally can not make phone calls, specifically on my Samsung Galaxy Tab 10.1 and I must say it is one of the android apps that impressed me. For starters, you can login with your Google Voice account , so all your contacts are automatically synced from your own Gmail account, for example. I begin to make the first call frame without any problems ... and starts the conversation, I'm surprised the sound quality, clear and crisp, and practically without any delay , much better than I expected at the time the application is installed. The interface is pretty simple , and not just be a black background with white text, but it does not really need more , there are many android applications where the use of a well done interface is essential, but in the case of GrooVe IP and not need it, you just need to make the connection is good and the sound quality is the best. In short, an extremely useful application when you can use a device that is not a phone, as in the case of a tablet, it can make calls and also c0n free. Now we just need to download it and tell us what you think.